Approx. 42" from the tractor's PTO shaft to the inside edge of the shoe. 5.5 ft -> Approx. 108" from center of pto input shaft to outer cutting edge. 7.0 ft -> Approx. 124" from center of pto input shaft to outer cutting edge. 9.0 ft -> Approx. 148" from center of pto input shaft to outer cutting edge. - Operating, Assembly, Parts manuals. FSBM Enorossi Assembly instruction manual corrections and tips. On page 24, a reference is made to a 30 point hitch arm. This should be "3 point" hitch arm. On page 26, It says "Check that all bob are well tightened..."
On page 8 where it says "Install the hydraulic lifting group (3) on the chassis (7a)." It does not point out that the four bolts used are not the same length. IMPORTANT -> One is shorter (25 mm) and must be used in the lower left hole. Reference: "Hydraulic cylinder flow valve adjustments"
Please note the flow valve adjustment to control the speed of raising and lowering the cutter bar is accomplished by turning the two valves on the hydraulic hose. 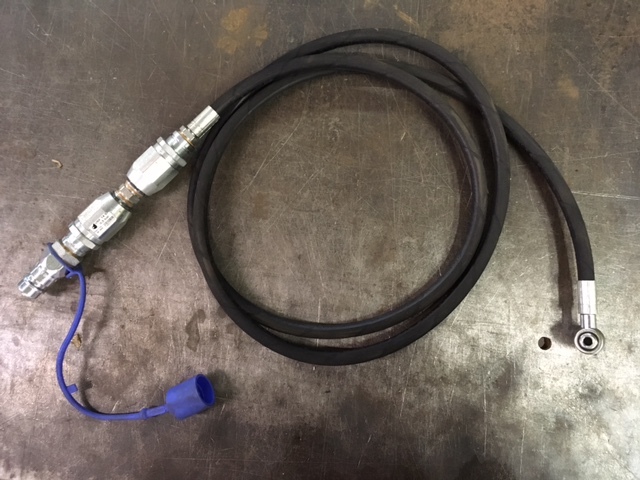 Above: The six foot long hose is made to connect to the rear of the tractor into remote valve quick couplers installed at the rear of the tractor to the end of the cylinder. The flow control fittings should it installed as pictured. 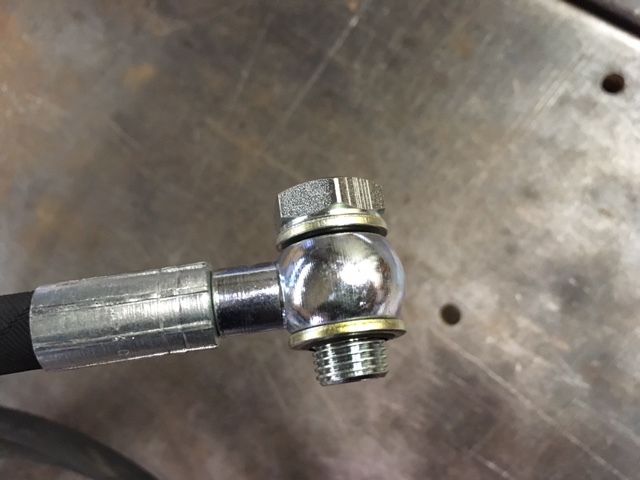 The hose fittings are designed to connect the male "quick couplers" fittings to std. 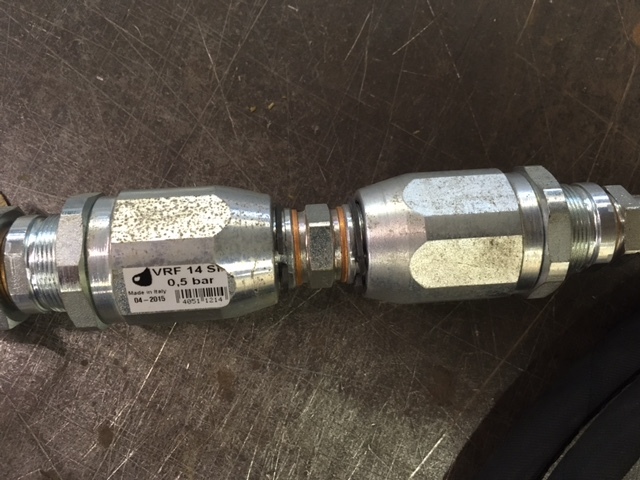 sized remote valve quick couplers installed at the rear of the tractor just as they come from the tractor manufactures. There may be some exceptions but we have seen them yet. 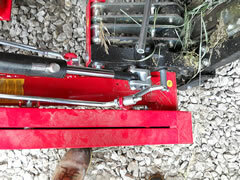 When you are powering the sickle bar mower hydraulics by connecting to compact tractor loader control valves, it's not unusual for the task to require some "creative plumbing." 1. You'll need to have a new longer hose made to replace the 6 ft one that came with the mower or have your "hose shop" store to make an extension for it. 2. 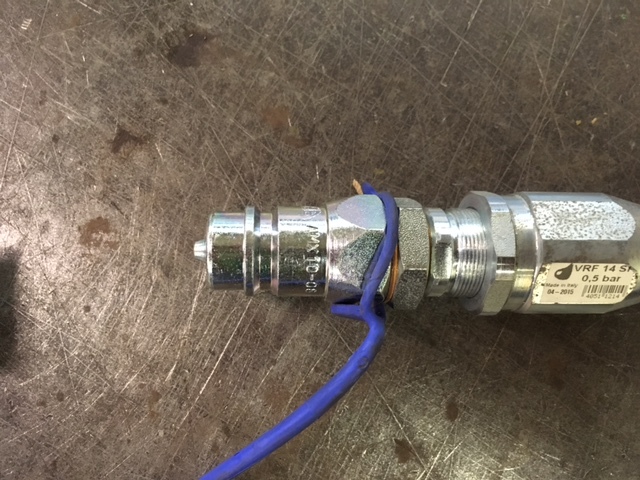 Since the hydraulic quick coupling fittings used on the front end loader control valves applications are smaller in size than the ones for the rear remotes, you'll need to purchase adapters, reducing bushings, different fittings, etc that will connect up to your loader plumbing. 3. Tip: If you are using the loader plumbing, most folks want to use the loader control valve that crowds/rolls/dumps the bucket. to operate the mower hydr. cylinder. Then you can leave the loader bucke on the tractor to use as a carry-all container., just remember to tie it in a secure position with a chain or cable. CLICK ON The photos on these pages to enlarge the images. The chain allows you to do pre-sets and take the stress off and stop continuous pressure calls on your tractor's hydraulic system. Thus... freeing up a little hp. The chain is to maintain the cutting height of the machine so you don't have to manual set it with your lift control each time you lower the machine to working position. 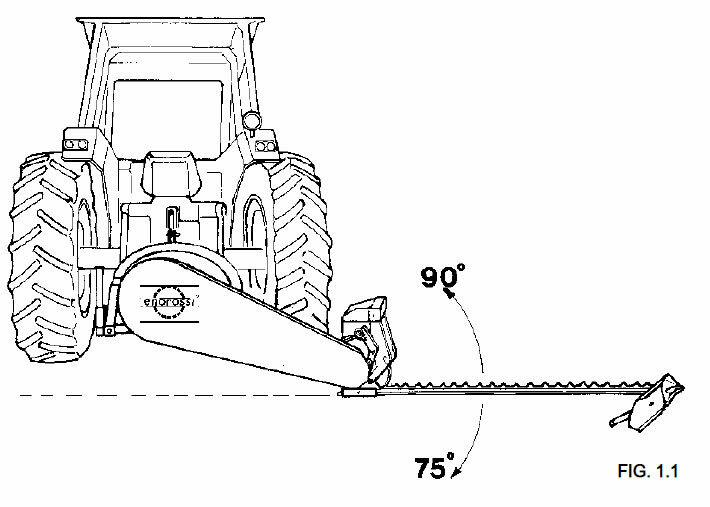 Serves the same function as the chain on the disc mower. You lower the machine till it is level then set the chain so that it is tight. Then when you lower the machine, it just descends till the chain is tight and it is in working position. 1. Standing in back of mower, insert rod from the right, with hook pointing left, into retaining bracket above belt tensioner spring. (First photo). 2. Slide rod half ways to the left, turn 180 deg so hook is down. (Second photo). 3. 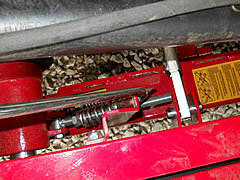 Insert threaded end of rod into stay bracket on right side of mower, and attach crank nut. (Third photo). When assembling connecting the drive assy. to the cutter bar pivot unit shaft. The instruction refer to "a ring" should be in place before sliding the pieces together. 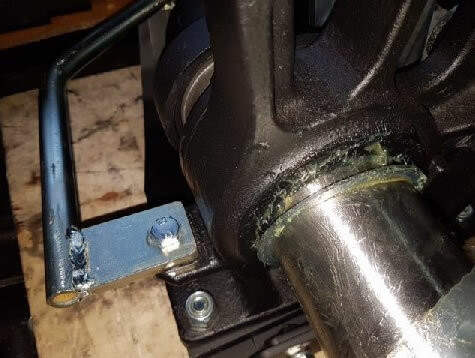 The ring isn't missing it's stuck to the housing with grease. They are the same "best quality in the world" Italian heat forged, refine sharpened razor edged sections that are installed on all the new SB mowers. Users have told me they last as much as five times longer than the cheap imitation Korean and Chinese made clones found at the big box and supply stores and are a no brainer excellent investment in quality products. The individual knife guards as well as the complete knife-blade bars and guard bars ( with heads, bushing and grease fitting) will be featured as well. As per customer's request, we are now stocking and shipping the EZ Rivet Tool and replacement parts. We started selling the tool in 1959 to our many Gleaner Combine owners. They loved it and considered it to be a "must have" tool. Our sickle bar mowers customer are loving it now as well. The special heavy duty tool really takes much of the hard work and all the hammering, chiseling, torch and anvil work out of replacing sickle blade rivets. Often times you can replace rivets without completely removing the knife bar from the mowing machine. You may still have to use a portable grinder to smooth down surfaces in some applications. The Carver - EZ Rivet tool sells for $ 79.00 ... includes the tool, tax, USPS delivery to your doorstep or PO Box. Let me know if you'd like to add this important tool to your "fix it box." The mower is shipped in a plastic covered crate. The assembly process is not easy and will require several hours labor, reading vague instructions from Italy and patience. A helper is almost a "must". First time tractor owners - homeowners and folks not accustomed to assembling farm and hay tool implements with hydraulic components will be wise to solicit the assistance from someone with experience in these areas. We'll help as much as possible with photos and tips via email. Find your manual and note the step by step instructions. We will be pleased to email a free copy to you. Pay close attention to the illustrations when attaching the various parts/brackets/ etc. Take at few minutes to read, then re-read the manual. You'll be really well prepared when start the assembly. 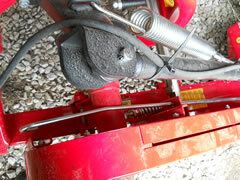 SB Mowers with hydraulic kit. The cylinder rod may be extended at arrival. Before mounting, manually push/ pull the rod in and out. It will be very tight so you'll need to anchor one end and use a rod or large screwdriver through the pinhole at the other end. 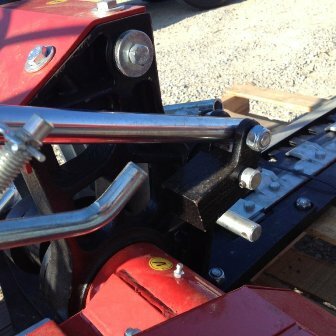 After it's moving, push - pull and finally push all the way to the "closed" position before attaching to the mower. Remove any paint from the fitting ports before installing the hose. A set of 3" (external) Snap Ring Pliers with be very helpful at SBM assembly when securing the snap ring on a large pin that joins the drive unit and the cutter bar assembly at the shoe. Here are some of excerpts from manual. 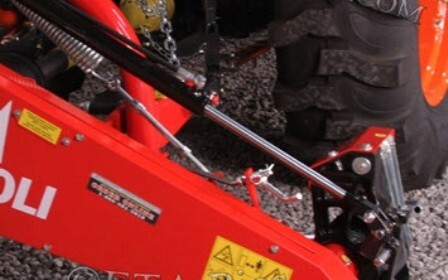 Most sickle bar mowers are shipped disassembled and packed in crates therefore before proceeding to connect unit to tractor fit is necessary to connect blade to three point hitch and main frame. Remove from support (1) pulley (3), snap ring E 80 and seeder ring � 80. Insert support (1) finto frame (2) and fasten with same snap ring and seeder ring. Screw or pulley (3) and connect cable (4) to link (5). Remove from support (1) pulley (3), snap ring E 80 and seeder ring � 80. Insert support (1) into frame (2) and fasten with same snap ring and seeder ring. Screw back ori pulley (3). Mount ori upper pin of support (1) fork hinge (4), insert cylinder shaft (5) and fasten with screw TE 14x65 (6). 3. Mount the three belts and external protection guard. 4. Mount lateral deflector (1) (Fig. 3.3) and fasten with screws TE 12x50 (12), washer � 12 (13) and self-locking nut 12 MA (14). Insert screw TE 12x90 (7), washer � 12 (8), spring (9) and fasten with self-locking nut (11). 5. For the models BFS 240/H , BFS 270/H insert hydraulic shaft position 5, figure 3.4 to link position 7, always in Figure 4.